Sometimes the hungering darkness can seduce a mortal. Their passion bringing into the world a hybrid of life and death, light and darkness. Dhampirs are the children of humans and vampires and in most ways a mockery of both. They are neither truly alive, nor truly undead, doing their best to find a place to call home, to find someone to love them. Often, they set out after adventure because there is nothing else for them. Dhampirs learn early in their lives to be wary. Few understand them and fewer still feel comfortable around them. If they do not take care and guard their origin closely, they may face certain doom. Their survival relies upon caution, perception, and wariness at all times. They know their environments and the best ways to make a hasty escape. They feel the darkness call to them. Hear the moon's song in the beat of their heart. They are hunters no matter how much they try to deny it. It is common for their natural coordination, strength, and toughness to lead them into the life of a warrior or criminal. They often find physical activities a natural outlet for their power. As an additional bonus, their heritage makes them quick learners at fighting, athletics and skulking about. A society of dhampirs is virtually unknown. They often find themselves in the company of one side of their heritage, generally to exclusion. If amongst humans and other mortals, it is common for them to hunt the undead. Their unnatural gifts are perfect for stalking the darkness with their own souls. However, they are also powerful agents for the undead, especially their vampiric forebears. They can move about in daylight, facilitating any number of important tasks. Plus, their powerful frames make them potent guardians, and their own hunger for blood gives them much in common with those that prey upon the living. A dhampir's existence is a personification of the cosmic battle between light and darkness. Dhampirs usually have names appropriate to the culture in which they were raised. Male Dhampir Names. 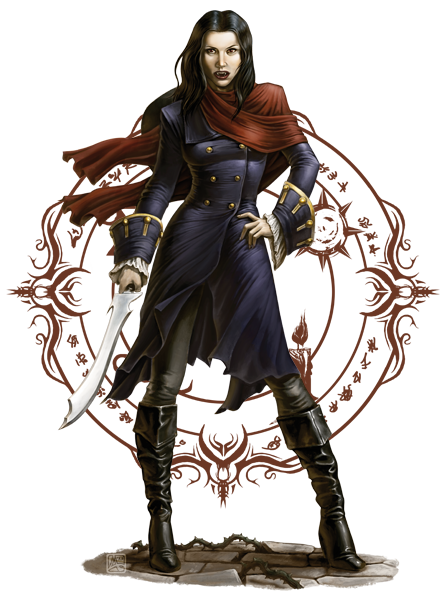 Abraham, Alucard, Johan, Kurst, Nox, Vlad, Zanos. Female Dhampir Names. Anna, Nyx, Persephone, Rose, Shakti, Wilhemena, Yaga. Your dhampir character has certain traits deriving from your vampire ancestry. Ability Score Increase. Your Constitution score increases by 1, your Dexterity score increases by 1, and your Strength score increases by 1. Age. Dampyr mature at the same rate as humans but live about twice as long. Alignment. Due the conflicting nature of their heritage, they are often neutral. Darkvision. Thanks to your undead heritage, your darkvision has a radius of 60 feet. Fangs. You are proficient with your bite (melee attack, reach 5 ft., one target) which deals 1d4 piercing damage on a hit. Blood Drinker. On the same turn you deal damage with your bite, you may use a bonus action to expend a hit die. Roll that die and add your Constitution modifier. You regain Hit Points equal to the total. After you use blood drinker, you can’t use it again until you complete a short or long rest. Skulking. You gain proficiency in the Stealth skill. Vampiric Resistance. You have resistance to necrotic damage.